since the consumption has been e.g. 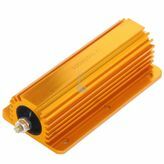 reduced from 55W to 20W. No rating for 24V 100W 10 Ohm CAN-Bus lighting fault resistance power resistor available.